I am in an upright position with my back and feet flat holding the ball between my knees. Do you fall forward over a jump? Do you have problems with drop fences? Do you brace your leg when jumping? Here’s a quick tip to improve your jumping position in the comfort of your own home. Next time you jump notice what happens to your position. Do you throw yourself forward on take off or fall back on landing? Do you brace against the stirrups on a drop fence? Does your horse throw his head up in the air or buck on landing? Do you wind up on your horse’s neck after the jump? In order to stay with your horse over the fence you need to remain in balance over your feet while your hips, knees and ankles absorb the movement of the horse. If your legs do not act like shock absorbers your upper body is going to get tossed around. I have folded forward into jumping position while extending my hands forward, toward the bit. 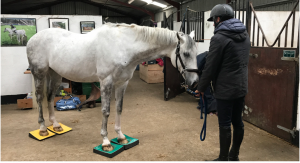 The following exercise will help you get the feeling of keeping your hips, knees and ankles soft while opening and closing at the hips for taking off and landing over fences. You will need something to put between your knees. I have like to use a small (55cm) exercise ball that is under-inflated. The amount of inflation depends upon the length of your legs and width of your hips. If the ball is too full your knees will turn out. If it does not have enough air in it you will have to grip with your knees. Find the amount of inflation that is comfortable for you when standing with your feet pointing forward about shoulder width apart. Place the ball between your knees, not at the top of your thighs. 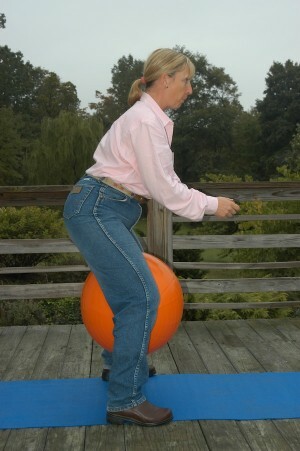 The saddle is shaped to fill in the area of the upper thigh but the ball is too round. If you put the ball at the top of your thigh you will have to turn your knees out, interfering with your ability to open and close at the hips. 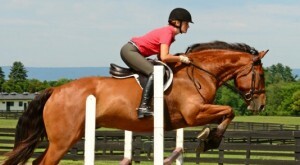 Bend you knees enough to simulate the length of stirrup you have in the saddle. I have leaned back from the hips to practice landing and drop fences. The more you bend the knees the shorter the stirrups, so be careful. You may feel this lesson in your thigh muscles. 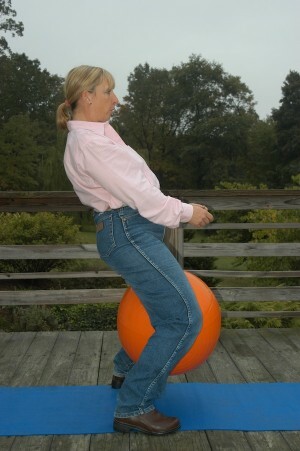 If you feel too much strain on your thighs straighten your legs slightly but be sure to keep some a bend. If you feel pain in any other part of your body reevaluate your position. Check that your feet are pointing forward, the ball isn’t too full of air and your back is flat. The thighs are the only place you want to feel any muscular effort. Simulate forward position by folding forward from the hips while keeping your knees bent. Find out if you can extend your arms without strain. Open at the hips to come upright without standing up. From upright lean back from the hips simulating the landing phase of the jump and drop fences. Notice if you tend to stand (straighten your knees). If so this means you are changing your stirrup length. 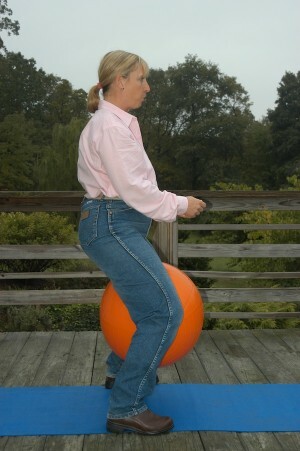 In the saddle you will push your lower leg forward out of position because the stirrup acts like a pendulum. Close and open at the hips with someone watching you or while looking in a mirror to be sure that your keep your back flat and your knees bent. Make sure to take breaks if your thighs begin to burn. Notice how easy it is to balance when your feet remain underneath you. Use this Murdoch Minute to improve your jumping position. Using a ball, with your back flat and your feet underneath you, feel what it is like to open and close at the hips. 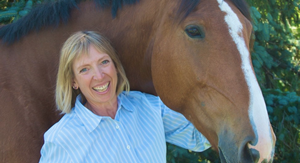 Keep that feeling when you are back in the saddle and always remember to – Enjoy the ride!